Part of being a Paneristi is to collect nice and special watch straps. I have written about straps made from vintage ammo pouches and one – not for Panerai in this case – made from the leather interior of a Mercedes SLR 300 (1956) formerly owned by Jean Todt. Last week, I received an e-mail about DaLuca’s Panerai Straps. The owner, Daniel Luczak, creates one-off straps for Panerai watches made out of ammo pouches and other vintage leather used for (mostly) military purposes. Each strap is individually named and will never be duplicated. 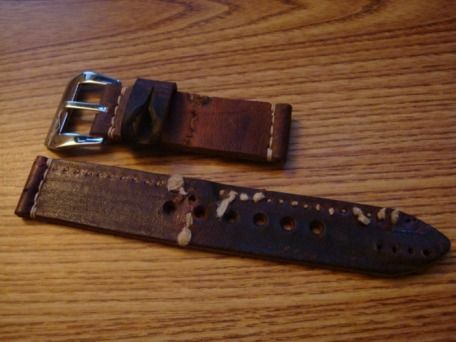 On PaneraiSource.com, you’ll find a well written and documented review of DaLuca straps. As I wrote some time ago, these kind of straps and intiatives makes me want to own a Panerai again. Just a basic Luminor model, or the new 1950 with in-house caliber, PAM312. One of the vintage Panerai straps from DaLuca is called ‘Bunker Hill Revolt’! Although violent scenes from WWII movies come to mind,the strap at least looks impressive and indeed made from leather that has been in or around bunkers during that time..
Below you’ll see a vintage Panerai strap called ‘flame thrower’. One can only imagine what this leather must have been going through..?Ç¬? The leather goes back to the 1940s and is super soft. Dan’s straps come with a sewn-in buckle (Pre-Vendome style), includes the tubes for attaching them safely to your Panerai and free shipping within the USA (outside, add 10 USD). Prices for the pictured straps are 290 USD (Bunker Hill Revolt) and 210 USD (Flamethrower). Payments can be made through PayPal or by Credit Card. Click http://www.dalucastraps.com/categories/Vintage-Watch-Straps/ for their entire collection of interesting Panerai straps. 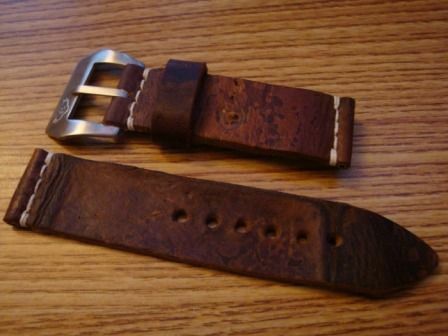 They also now create gorgeous croc handmade panerai watch straps.